Ever Wondered Where the McTwist Originated? In terms of riding styles, board design and course creation, the world of skateboarding has been significantly impacted by its participants. The sport has continuously evolved thanks to devoted participants who have constantly sought ways to push the envelope by designing and refining techniques new and old alike. One of the best examples of innovation at work is a trick that was first developed in 1984 by Mike McGill, a skateboarder who has since gone on to own and run his own skate-shop in Encinitas, California. This move is known as the McTwist and it has become a staple in skateboarding circles. While at a summer camp in Sweden in 1984, Mike McGill first managed to land what would become known as the McTwist. Focusing on the idea, he realized that the trick would have to be performed from a few feet in the air and that he would need to spin his body around one and a half times after jumping the lip. It took him approximately 40 minutes to successfully complete the McTwist for the first time and land safely. After viewing himself on video, McGill began to alter the trick by flipping his body over during the spin. The McTwist consists of the rider performing a front flip while at the same time doing a backside 540. While the McTwist is being performed, a variety of board grabs – most often a mute grab, initially used by Mike McGill – can be used to give the trick more impression and style. The trick is traditionally executed on a halfpipe and as the skater clears the lip, the head and front shoulder is lowered followed by jumping off the lip and doing a front flip. While doing so, the rider crouches down, grabs the board and twists their body around right in order to finish the McTwist. From the moment Mike McGill first initiated the concept of the McTwist, himself and others have been adapting it and bringing notoriety to it. After McGill performed the McTwist in competitive skating events, it was adopted by organizers. 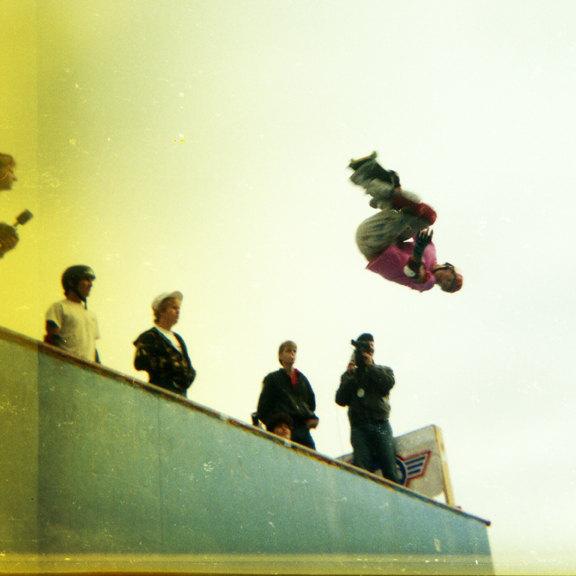 Ultimately, in order to participate in many high level skating competitions, performing the McTwist became a prerequisite. Since its inception, the trick has moved into the snowboarding world as well, with Shaun White successfully debuting a new form of the trick known as the Double McTwist 1260 – a two-flip, three-and-a-half spin version of the original. Nearly twenty years ago, Mike McGill had no idea at the time that he would start a phenomenon that would eventually become a staple of the skateboarding and snowboarding experience. The ingenious concept of the McTwist speaks to the flexibility and open-source environment of skateboarding and snowboarding, where anyone can use his or her talents to develop a new concept, trick or strategy to enrich the sport and make it more enjoyable for all. Let this be an inspiration to all who ride in their own way and have their own sense of style when it comes to performing tricks. This entry was posted in Land Sports, Skateboarding and tagged McTwist, Mike McGill, Skateboarding Tricks. Bookmark the permalink.